At seven and a half in the evening, BASE Milano main room is overwhelmed by people. And it continues to arrive. Everyone is here to see a lecture about data visualization. I think: well, the times are finally changing in Italy and Meet The Media Guru, like it or not, has contributed significantly to it over the past 10 years. At the same time, I think that beyond the great work of Maria Grazia Mattei and her staff, it is clear that the guest in question is not quite a common designer: and surely Giorgia Lupi is not. Giorgia Lupi likes to define herself as an “information designer”: with her company Accurat she works in the field of data visualization for companies, organizations, cultural and artistic projects of various kinds. 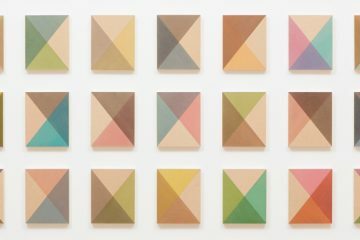 What characterizes Giorgia’s work, which inevitably attracted my attention, is the almost magical balance between digital and analogue that guides her work. Complex data captured by algorithms and machine learning systems, accompanied by a “paper and pen” display. Almost infantile colors and shapes that seem to reflect the physicality of Giorgia, drawn with care and almost maniacally attention in their correspondence to the single figure, but whose result is pure poetry. Or magic. Because in the presentation I attended the day before at ACIN (Accenture Customer Innovation Network), the new Milan hub (integrated in a global network with poles in Bangalore, Manila and Singapore) for open innovation led by Accenture and devoted to the worlds of retail, fashion and consumer goods, and the one at BASE, the true question that arises is: how is it possible to draw by hand given ephemeral data, a number, a value so precisely? But it is not all about technicism, on the contrary: Giorgia Lupi‘s true magic is to make the technical aspect less interesting than the poetry that lies underneath it, or anyway, less present. That, as you may agree, has more critiques from the art world than from design: at least, following those disciplinary borders that today no longer have reason to exist. 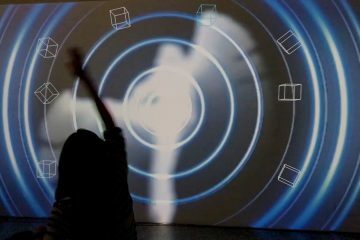 Giorgia uses the technique to talk about life: she uses the digital to narrate the real. 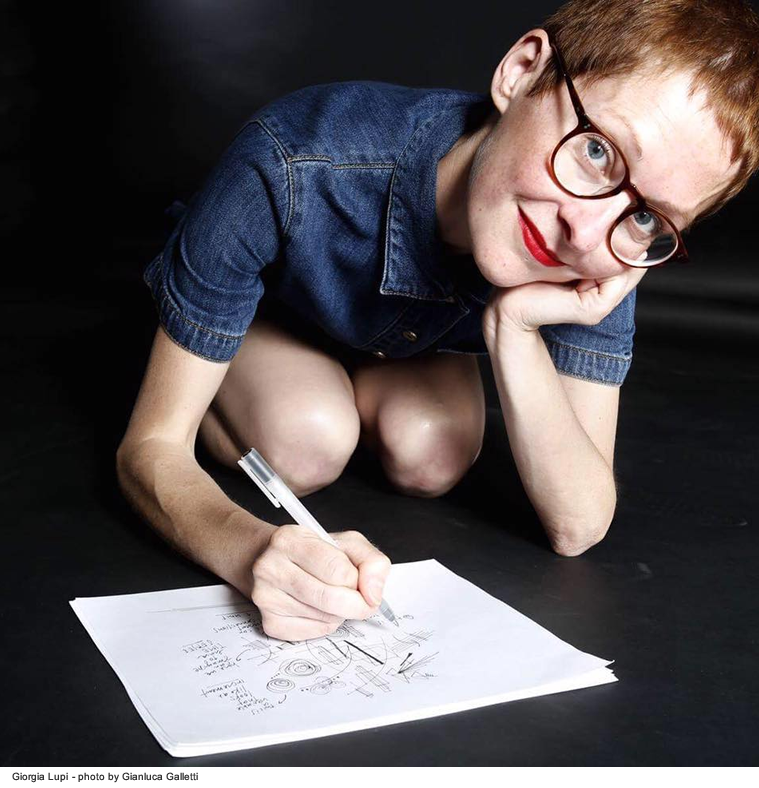 She called it Data Humanism, the ability to associate data with people who generate them, with their behaviors and habits: data considerated as a narrative element, which can be represented with a strongly creative element of immediate impact, such as drawing. This may be the case for viewing and interpreting the Amazon database (Amazon’s Data Like To Life, for the Fast Company Innovation by Design Awards Conference), in an IBM consulting, for an artistic project such as the collaboration with Kaki King (A Dialogue between Four Hands), or as part of a very personal life project like the beautiful Dear Data. 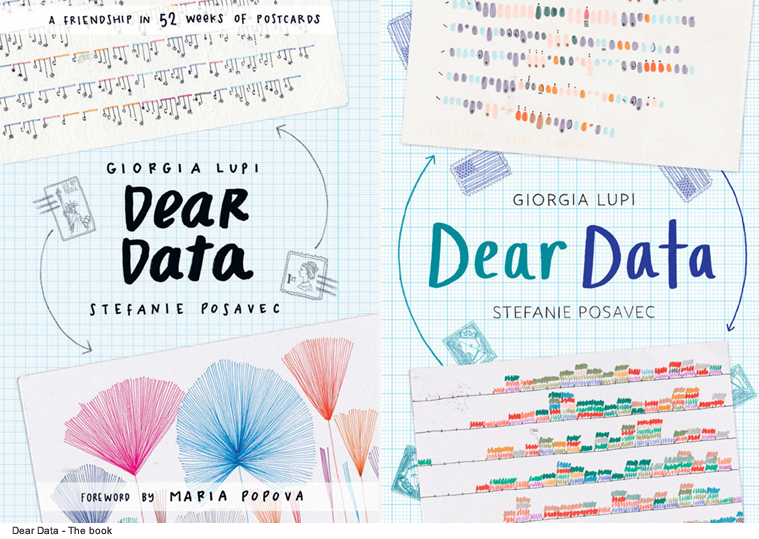 This is the project that has made Giorgia Lupi famous worldwide, an incredible work of visualizing personal data, almost intimate, able to tell ordinary life situations of two designers, Giorgia and Stefanie Posavec. Day by day, for a year, the two girls have drawn their lives on postcards, sharing them across the ocean (Giorgia from New York and Stefanie from London), getting to know each other more and more, slowly and gradually, in order to collect their works in a 300-page book, published by the Princeton Architectural Press in the United States and by Particular Books in Europe. And, for those of you who do not know yet, the original collection of postcards and sketches is now part of the permanent collection of the Museum of Modern Art in New York…. 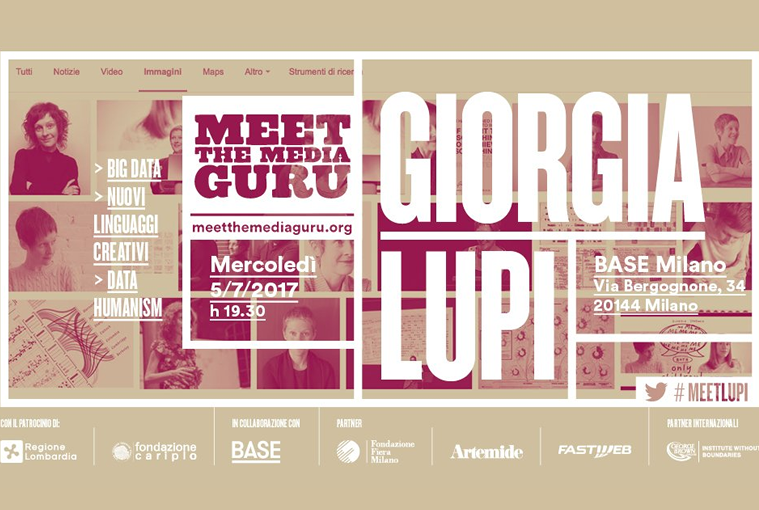 Marco Mancuso: Giorgia Lupi, information designer and artist: I am interested in knowing more about your background and what has led you to information design. Giorgia Lupi: I have always been a collector. When I was a kid I would spend an incredible amount of time collecting and organizing all kind of items into transparent folders that I would then tag with maniacal care. Colored pieces of papers, little stones, pieces of textiles from my grandmother’s tailor-shop, buttons, sales receipts and many more formed my collection. I remember the pleasure of categorizing my treasures according to their colors, sizes and dimensions and drawing tiny labels to specify how to read them. Without really being able to explain it, I believe I was already working with a data-driven mindset! But also, as a human being, I have a very visual mind: I need to draw and sketch to understand my surroundings. In fact, I’m not usually able to perfectly get and define what I’m thinking, or what pops up in my mind about a design problem, I usually say that I cannot think about a project without a pen and paper. I know drawing and expressing myself visually is my way to understand that I’ve had an idea in the first place. But I don’t take pleasure in producing graphic designs per se, I instead enjoy designing visual artifacts that have a logical and structural sense. I love shaping visual ways to represent quantitative and rigorous parameters. I see data visualization as the combination of my artistic side and my extremely rational one, what drives me in what I do is the overlapping space between analysis and intuition, between logic and beauty, between numbers and images. As for my background: I studied architecture, but it happened that I have never built or designed any houses. During my M.Arch studies I’ve always been very interested in aspects concerning the representation of information, and I tried to push all my architectural and urban projects towards working with information and mapping systems. For the following 4 years I’ve been collaborating with different interaction design firms in Italy focusing my contributions on visual documentation and representation, mapping and information architecture. It wasn’t until lately that I started working specifically with data visualization.It came natural to me to progressively focus more and more on the quantitative side within information design field, and when I got to understand the true potential of working visually with structured data to convey information about phenomena or contexts, I simply felt in love with this world and the realm of possibility it opens. Giorgia Lupi: For many readers, the word “data-visualization” might be associated with heavy programming skills, complex softwares and huge numbers for the most part, but, believe it or not, lots of data visualization designers use old-fashioned sketching and drawing techniques on paper as their primary design tool: they sketch with data to understand what is in the numbers and how to organize those quantities in a visual way to gain meaning out of it. In my daily job I am the design director at Accurat, a data-driven design firm, and although we mostly create digital experiences with data, I still use drawing as my primary form of understanding and as my most important tool for designing every time. Sketching with data — so, in a way, removing technology from the equation before bringing it back to finalize the design with digital tools — introduces novel ways of thinking and leads to designs that are uniquely customized for the specific type of data problems we are working with as opposed to relying on standard. 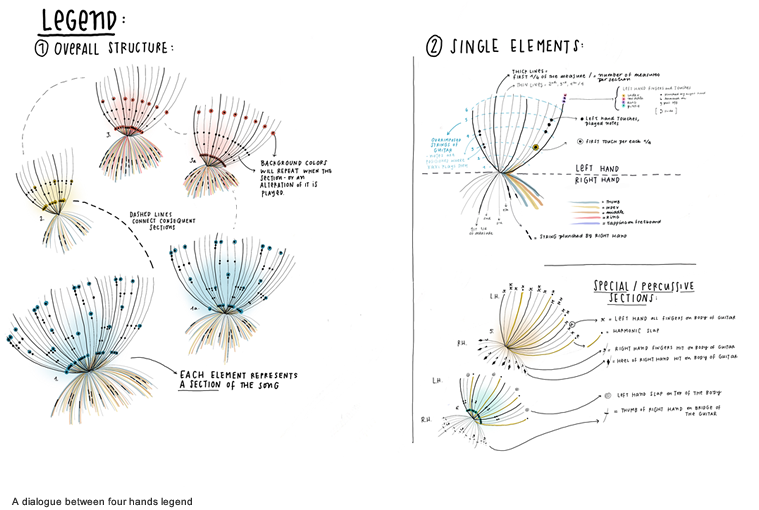 In fact, in designing data visualizations, a very common and sometimes misleading approach is to start from what the tools you have can easily create, and maybe also from what we — as designers — feel more comfortable in doing with these tools, but this can lead to adopt the easiest, and maybe not the best, solution to represent important aspects of the information. As opposite, when I am sketching to explore the dimensions of a dataset, I don’t have access to the actual data with my pen and paper, but only to its logical organizations, and this is an invaluable asset to focus on the meaning of information, and not on numbers out of context. Drawing with data is an invaluable tool to discover what is unique about the numbers at hand. It also raises new questions about the data itself. This limiting practice helps to reveal new possible analyses to perform: Instead of being overwhelmed by the size of a dataset and by millions of numbers, we focus only on their nature, their organization, and doing so often opens new opportunities originating from this vantage point. Marco Mancuso: In your approach to data visualization, graphics always seem functional to a narration: reminds me of the methodology of some of Aaron Koblin‘s work, especially those of the Google Creative Lab period. It is also the medium through which you talk about experiences, people, emotions, making data an alive element. Do you recognize in this definition? Giorgia Lupi: I do, but as a designer and artist, I am also always questioning the role of data, in my practice. I always say that data serves primarily as material for me: a craftsperson might compare my data visualization design work to sculpting with wood or painting with oil. If you think about it, sculpting with wood requires a different process and can communicate different things than sculpting with steel or painting with oil. But equally, for me, data defines the “form” in the same way that wood defines the form, and for this reason we need to respect this “material” we are working with, data. As we would let wood, or steel guide the forms we make, and same goes for data, and we have to be aware of it! Data for me is also the medium: the vehicle that conveys these stories that I want to bring to life. I often say that – to understand data’s true potential, we have to really understand data and their true potential, sometimes we have to actually forget about them and see through them, instead. Because data are just a tool – one of the tools – we use to represent reality. They are always a placeholder for something else but they are never the real thing. Data is a tool that filters reality in a highly subjective way: How a dataset is collected and the information included—and omitted—directly determines the course of its life. Data has this unique power to abstract the world, and it can really help us understand it according to different – relevant – factors – every time. 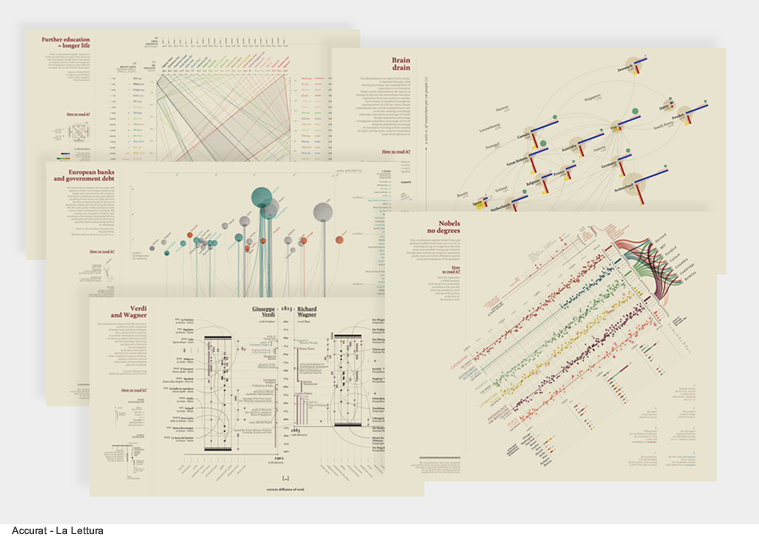 Marco Mancuso: What data do you like to visualize most? Do you have data inspiring you more than others? Giorgia Lupi: I like to find data in unexpected contexts, and use it as a new pair of eyes to see more, and better. And for this reasons, I believe all kind of data are interesting and fascinating, If only we reclaim subjectivity on how data is captured and collected, and reclaiming subjectivity – and beauty – on how data is represented. Marco Mancuso: How do you proceed in your work and artistic creation, producing a data visualization that is more “scientific”, “aesthetic” or “emotional”. In other words, how does the goal affect or not the process? I believe that whether the visualization is “scientific”, there is a value in designing pleasant aesthetics that tell data stories; I like thus to describe my approach and our work as an attempt to “compose” aesthetically beautiful and multi layered images with data. Of course, the accuracy of information representation principles should be followed, and we try to do it while always pushing a little bit farther the boundaries of what we can produce, visually speaking. Marco Mancuso: In Alberto Cairo‘s book “The functional art. An introduction to information graphics and visualization”, which I know to be a point of reference for you, one of the key concepts covered in the book is that “form follows function and it somehow narrows the form”. Do you still agree with this statement after some years, or do software for data visualization developments today allow you new degrees of freedom? Giorgia Lupi: I still agree, I mentioned before how the stories we are working with and the data we are working with should define the “form”, the visual form we use to represent them. 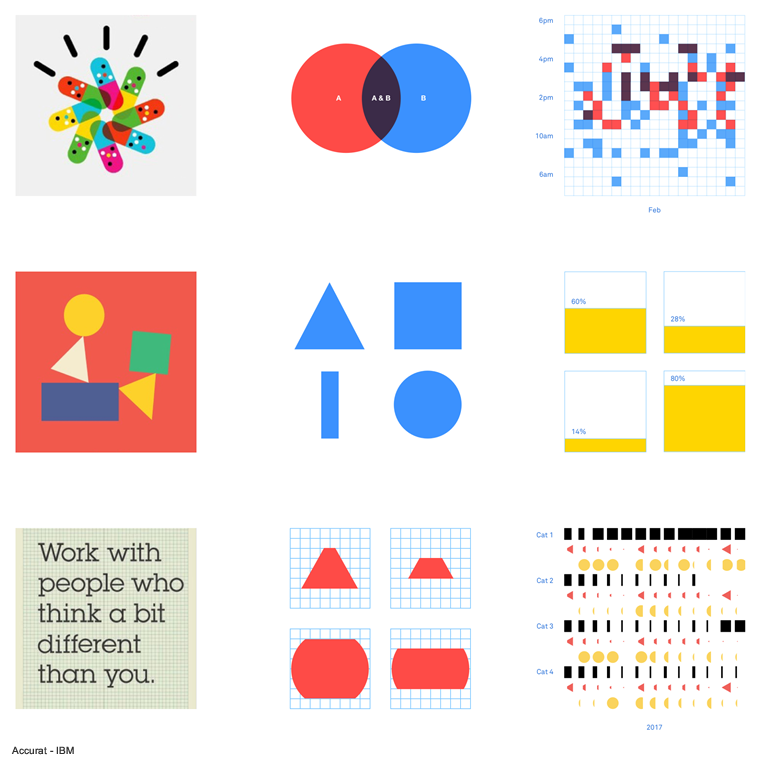 Especially now that data are growing in number and in type, I believe there is a true value in designing visual representations that are completely specific to the content you are working with and to their very context. The more data we are producing, the more we need to experiment on new visual languages (and thus “forms”) that go beyond the conventions: languages that will be able to depict the big variety of data we will be working with. Marco Mancuso: You suggested the idea that our age can be seen as a new Renaissance, where we have the opportunity to look at data according to a new vision: most closely linked to the humans that – directly or indirectly – produce them. You’ve called this process Data Humanism and I love the images that accompany it, that visual parallelism between the technical layout of the digital font and the inaccuracy of the calligraphic gesture. To whom is your message of awareness, more to the people or to the professional worlds of design and art? Giorgia Lupi: This message is for people who work with data everyday, to hopefully shift the focus from the numbers, the quantities and the technologies around them, to what numbers really stand for: stories, people, knowledge, ideas. But this message is also for everyone else: somehow in our culture we think that data will be the ultimate answer to all of our question, but it’s not. In my TED talk I shared how, for me, data is always the beginning of the conversation instead, I talked about how data is imperfect, because it’s inherently human made.“Data-driven” doesn’t mean “unmistakably true,” and it never did. It’s time to leave behind any presumption of absolute control and universal truth and embrace an informed depiction of the big numbers and small imperfections that work together to describe reality. And this gets me back to how we, as professionals should deal with data: to make data faithfully representative of our human nature, we need to start designing ways to include empathy, imperfection and human qualities in how we collect – process – interpret and display them. I see a data land where talking about data will mean talking about its intimate quality, in conversations that will be shaped around subjective, imperfect, even serendipitous aspects. 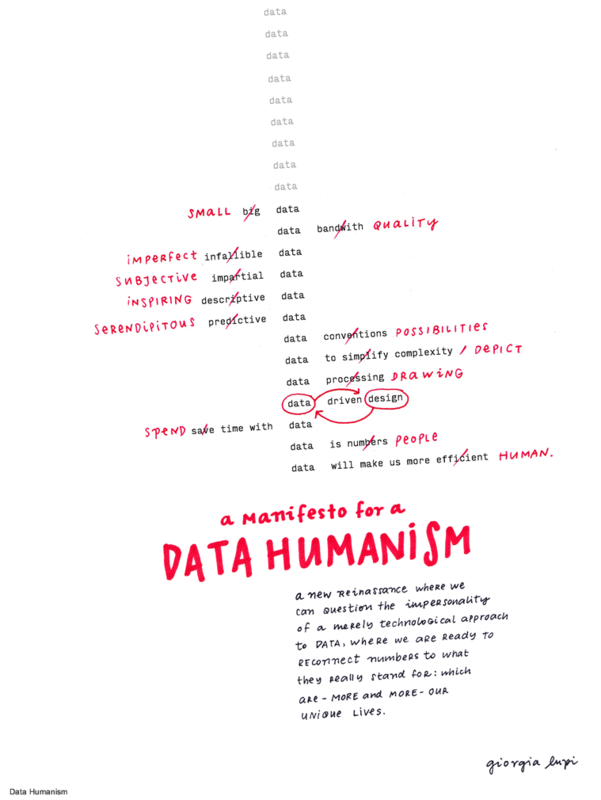 A place where data conventions are replaced by data possibilities, where data driven design is maybe replaced by design driven data, and where ultimately – instead of using data only to become more efficient, we will all use data to become more human. Giorgia Lupi: In our ongoing collaboration, musician Kaki King and I, aim at exploring how we can use data to engage deeper experiences, how we can help people “feel music” and “see music” through data. 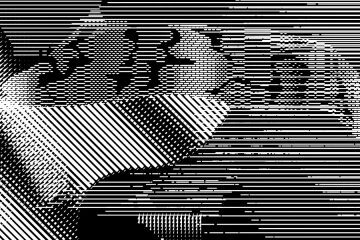 It is also a multimedia exploration of the role of data in our lives, and a call for what we were talking before: to reclaim subjectivity on how data is captured and collected, and embrace the subjectivity that invariably comes with how data is represented. For our collaboration we started from a simple question: what is that our hands – the medium we both use for our work – can tell about us? We of course collected data about it. We collected one mundane and ordinary day of data about all of the things that we did with our hands (what and who did we touch, what was the gesture, what was the sensation…). I used our 2 days of data collection and I merged them to create a “Visual Score”, where all of our the things we touched for that day are translated into visual symbols. I handed the visual score to Kaki, and she composed a song based on the rules and the metrics of our data collection, which for her has been something new that led her to compose music in a way she never would have thought of. But our collaboration didn’t end here: I was interested in finding a way to capture and display how the song was played, and what her hands did on the guitar. So we started a new data collection: for every note of the song, we manually annotated information on which fingers she used for each notes, the different techniques and all of the movements of her hands on the guitar. Because especially in Kaki’s case, since she uses a lot of unorthodox technique, there is so much information that is difficult to express through regular scores without developing an entirely new visual system. I then – of course – meticulously visualized all of these information. Instead of focusing on a linear representation of the music, which would have been simply a visualization of the partiture and tabs, I played with a different approach: following the repetitive nature of the song, which is clearly structured by sections. The song that Kaki wrote has interchangeable parts. One can be played after another in an almost random order and it will still function well as a composition. We premiered the project at the Design Indaba festival in Cape Town, where Kaki was playing live as we guided the audience through the all process, and it has been a great success! Kaki and I are aiming at doing much more together, presenting this combination of data, visual and music at live events, and keeping on exploring this journey through data and the senses. Marco Mancuso: Something on Dear Data: what fascinates me, obviously beyond the “immediacy” of the idea, its almost childish aesthetic drawing and the correspondence of the narration of your lives, is the media dimension. 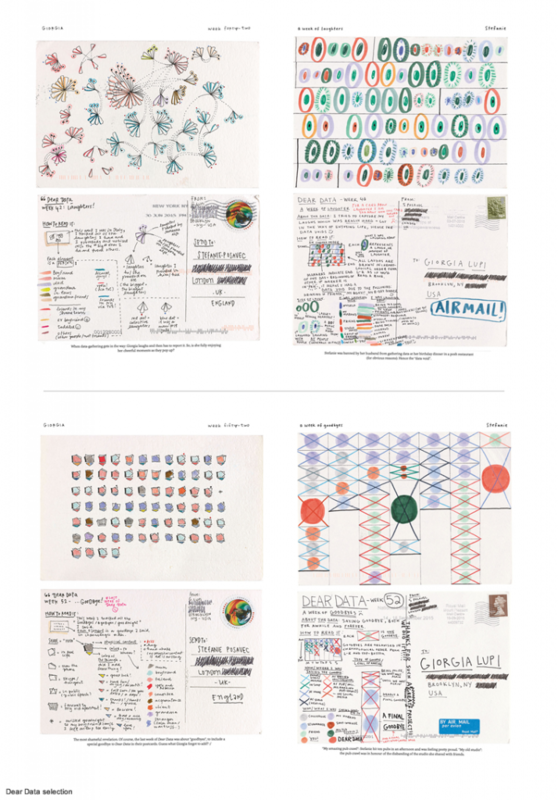 The fact that data visualization and symbols and legend to read were printed on postcards to send you monthly for greater knowledge of each other. Mail shipping, across the ocean. Do you somehow feel the need to pay more attention to the details of our lives, to tell them with feeling, to describe them with slow, meticulous and loving gestures, in contrast to the overwhelming overload of information that seems to mark our lives now? 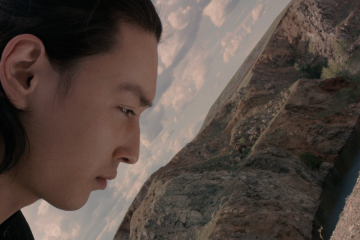 Giorgia Lupi: Dear Data was a meditative experience, on a personal level. The premise for embarking in such a long and laborious project, was the will to explore the role that data can have in understanding personal experiences and in being able to make stories of people’s lives from it: data is often considered to be very impersonal, but this project aimed to highlight the opposite through the exploration of using something seemingly ‘cold’ to communicate messy, emotional, human lives. As for the physicality – It was important to us that the data is experienced in a physical format, the postcard, we both love the beauty of the act of “discovering” while physically flipping the card from the back to the front over and over, as opposed to having everything in the same visible place. There is a slowness, a forced reflection required by the medium that is unique: both the process and the product are intensely human, each postcard takes time to design and time to read; it requires, on both ends, a sort of emotional attentiveness. And the “slowness” of these weekly effort that we have been doing for a year produced a slow and meditative dialogue, an unhurried type of indulgence, that in this moment when we breathe by refreshing our status has been for me a real sort of meditation. I believe there is a huge potential to use this form of active personal data gathering (as opposed to the cold and impersonal quantified-self movement) to increase mental wellness, and I am incredibly interested in exploring it further. 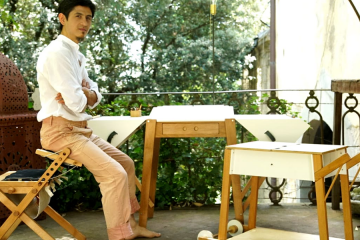 Marco Mancuso: To date, are you more artist or designer? 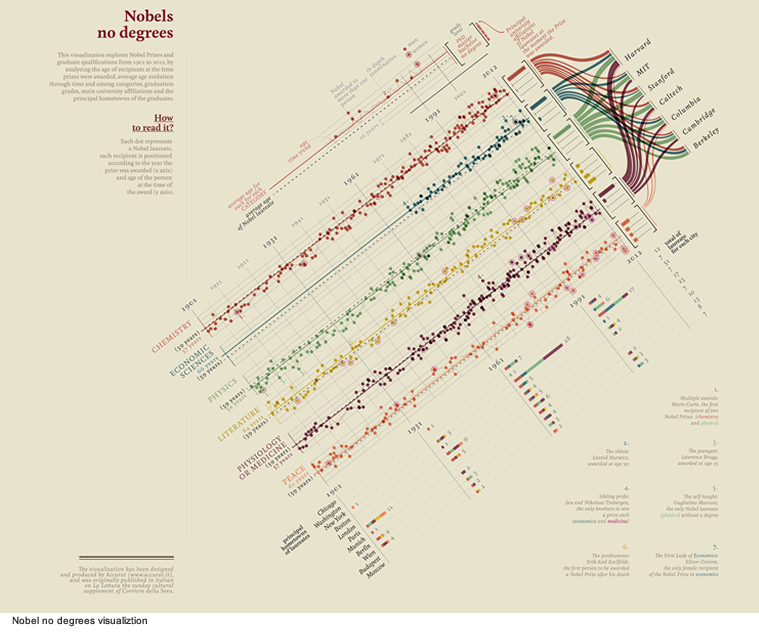 To say, do you like more an effective visualization or a beautiful one? Giorgia Lupi: I am not a huge fan of definitions, I prefer to blur boundaries and expand my practice rather than trying to define it. I think of myself as a data visualization designer and artist, and an artisan of data. As for effectiveness and beauty: I believe functionality (i.e. accuracy in the representation of data) should be given for granted and achieved in every data visualization design, but beauty and functionality together achieve extraordinary outcomes, so we should aim at both. Marco Mancuso: Do you feel you can be enough creative to continue working along this subtle balance even in the years to come? Giorgia Lupi: I hope so. Marco Mancuso is an indipendent art critic, curator, lecturer and publisher. 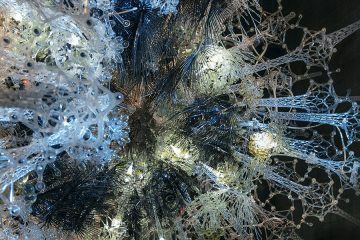 He focuses his research on the impact of technologies and science on art, design and contemporary culture. Founder and director from 2005 at Digicult he teaches at NABA and IED in Milano, Accademia di Belle Arti Carrara in Bergamo and is visiting lecturer at RUFA in Rome. He researches and curates exhibitions and projects on art-technology and partnered with many of the most important institutions in the field. He lectures and takes part in round tables and meetings. He collaborates with the art space Adiacenze in Bologna.